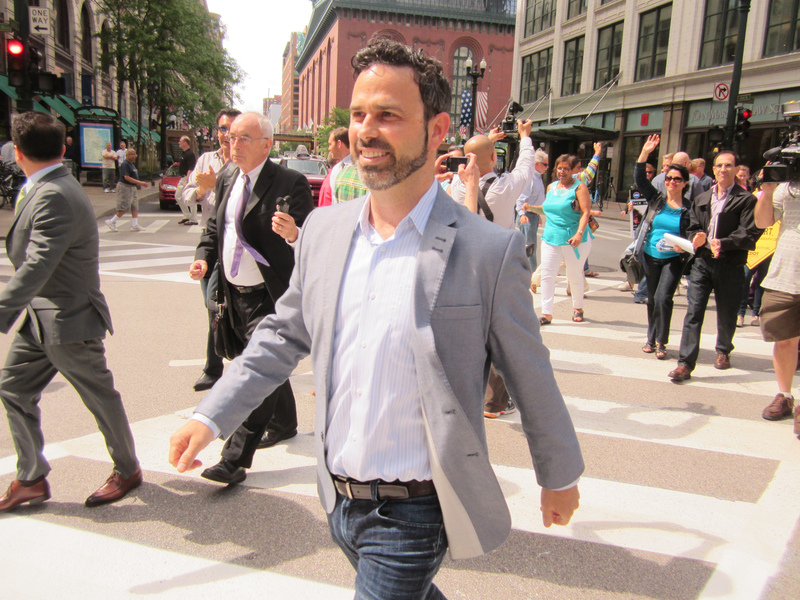 Maybe we jinxed things by naming transportation czar Gabe Klein as the city’s best department head in this magazine’s October 31 Best of Chicago issue, because the very next day he announced he was stepping down. Can’t really blame the guy since, two-and-a-half years after he took the job, his wife is still living in his previous hometown of Washington, D.C., where he’ll be returning to launch new transportation technology enterprises in the private sector. Still, it’s a shame that the poster boy for reconfiguring urban streets to serve all road users, not just drivers, is leaving the Windy City in his bicycle taillights. I caught up with him at his downtown office for a final chat. To ask the classic annoying job interview question, what was your biggest weakness as commissioner? Coming to town and not necessarily understanding all the history of how the city works meant there was a bigger learning curve. I came in with Mayor Emanuel and had this idea that we were going to set the world on fire and change transportation in Chicago. That’s a double-edged sword. If I didn’t think that way, we wouldn’t have been able to get as much done, but you also rub some people the wrong way. So maybe I could have been a little less boisterous? I don’t know. What do you feel have been your top accomplishments in Chicago? I’m very proud of the speed-camera program. I think it will have the widest-ranging impact on Chicagoans, and it was probably the hardest thing politically to do. I’m proud that we took a stand and said we’re going to take safety seriously. The numbers are showing that it’s already working. People are paranoid that they’re going to get a ticket. That’s a wonderful thing. Divvy bike-share is also having a huge impact. I knew that guys like you and I were going to ride it. It’s the people that get on it who haven’t been on a bike forever that are like, “Wow, I can use this as transportation,” that inspire me. I’m proud of how we launched it. We really were focused on every customer interaction: the placement of the stations, the color of the bikes, every Facebook post and tweet. And if you look at how it has played out, we have 11,000 members, so we’re not the biggest system in the world, but it’s a very stable, healthy system that’s going to be here for a long time. We just got federal funding for another seventy-five stations, which would put us at 475, the most stations in North America, and we’ve applied for state money for another seventy-five. We’ve also gotten better at the basics. When I got here, the potholes were atrocious, and there were too many streetlights out. I’m a big believer that you can’t run until you can walk, and nobody should give you the keys to the Mercedes if you don’t know how to drive the Chevette. We showed very quickly that we could get it under control. We’ve quadrupled the number of street repaving miles we’re doing on arterials and we’ve only got 0.3 percent of the lights out. I’m also proud of our focus on the pedestrian as the indicator species of a healthy city, and when we rolled out our Complete Streets Guidelines, just being bold and having the mayor get on board with it and say we’re putting pedestrians first. Because if you don’t, your city’s not going to be successful. The real estate value’s going to go down, and families won’t stay in your city because it’s not safe. I think people had forgotten that walking is the most basic and most important part of a transportation system. A spokesman for the National Motorists Association recently called you a “two-wheeled zealot” and complained that speed cameras, protected bike lanes and the bus rapid transit plan are infringing on drivers’ rights. He said, “Klein doesn’t like cars, so I don’t like him.” Any response to that? As far as speed cameras, I’m sorry dude, but I don’t care as much about your opinion as the lives that we’re saving. I don’t think it’s a God-given right to be able to break the law every single day. I think you are given the right by the government to drive a car. That’s why you’re licensed, and if you want to break the law, if you want to speed all the time, you probably shouldn’t drive. Another thing is, I actually do like cars. I just don’t like them being used for everything all the time. An imbalanced transportation system where the car is king is an inefficient, unsustainable and unhealthy system, and it’s going to kill our economy as well as the environment. What we’ve shown is that a balanced transportation system is safer, more economically sustainable, and more fun. I think that this idea that you have to be for one mode, that you have to be a car person, or a bike person, or transit person, is just a red herring.